The introduction of the common currency in Europe determined unprecedented changes in the economic conditions faced by each Member State. When the sovereign debt crisis hit, the most indebted countries blamed the euro for the inability to reduce their debt by means of money production. Such a remedy was commonly adopted by some countries to counter high deficits and to keep their debt sustainable, but its drawback of progressively and permanently damaging their credibility on financial markets was a serious matter. In fact, the bad reputation of the eurozone periphery among investors was arguably a driving reason for joining countries with a better image in a currency union. This fact suggests that repeatedly dealing with the issue of debt by inflating it away is unlikely to work in the long run and blaming the common currency for precluding this procedure is pointless. A more relevant argument, instead, could be shaped around the events that preceded the crisis in order to show that the problem would not have arisen in the first place had they simply exploited the interest rate decline in a fiscally responsible way. In fact, being part of a credible union provided the opportunity for some countries to deal with their structural problems; an unseized opportunity that ended up exacerbating the crisis. 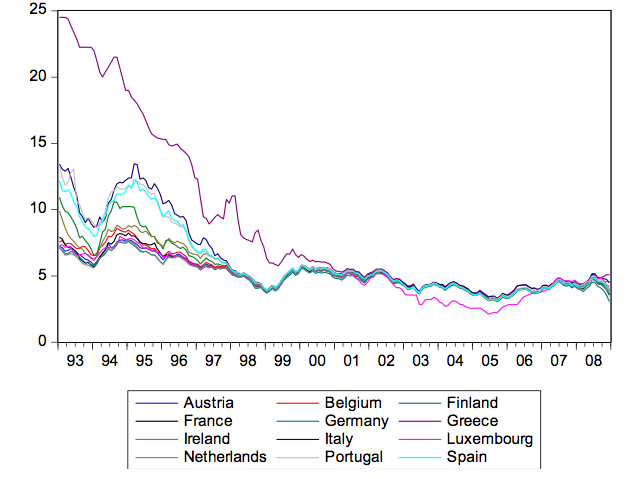 As it is clear from the graph that follows, the cost of debt was drastically cut down due to the fact that interest rate drops were huge in many European countries. This implied that some countries, in particular Greece, Italy, Portugal and Spain could save billions of euros every year as a consequence of this favorable external shock. Euro-enthusiasts never forget to point out that a lower cost of debt was a positive feature that characterized the first decade of existence of the common currency, however, the relevant issue is how governments exploited this situation. An interesting case is offered by Italy and Greece, two countries greatly affected by the sovereign debt crisis and whose high debt levels are not a consequence of 2008 recession, but have been above 100%, as a share of GDP, since the early ‘90s. Clearly, debt has been an issue for a long time and the drop in interest rate represented a great opportunity to reduce it. Nevertheless (see the following graph), deficits as a percentage of GDP do not show a significant change in their trend. 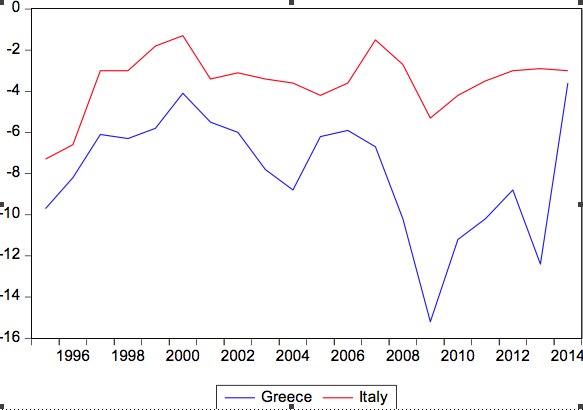 In fact, the average of annual deficits on GDP between 1999 and 2007 is 6.3% for Greece and 2.9% for Italy. In a period of favorable economic conditions, these countries should have acted differently. It is worthy to analyze the behavior of governments by comparing the growth rates of GDP and of government expenditure; whereas a tax increase allows reducing deficits (at least in the short run) but is detrimental to economic activity, a slowdown in the growth rate of government expenditure is a better suited means to address the debt issue. According to data from Eurostat, in the period from 1999 to 2007 Italian GDP grew by 37.3%, whereas its government expenditure growth rate was as high as 35.7%. By far the most indebted country in Europe at the time, Italy’s growth in expenditure should have been way lower than its GDP growth if there had been any willingness to tackle the problem, especially in a period where external shocks led to substantially lower costs for the government. What instead can be noticed is that other European countries on average, as shown by the aggregate statistics for the Euro Area (12 countries), experienced a GDP growth of 39.63%, higher than the Italian one, and a government expenditure growth of 33.5%, lower than the Italian rate. Paradoxically, the country that more than everyone else should have taken actions to reduce a way too burdensome debt seems to have done less to solve that problem than the other members of the monetary union on average. The situation of Greece is even more extreme, in that government expenditure grew faster than GDP: 69.6% and 66.3% respectively. The argument that considers the reduction in interest rates a positive implication is, at least for Greece and Italy, flawed, since a lower cost of debt was more than compensated by an increase in other types of expenditure in both countries. Lower interest rates could have been beneficial had these countries behaved more responsibly, but were in fact detrimental as they provided an incentive for politicians to spend even more. It is thus unlikely that any external shock that leads to a reduction of costs faced by the government could be of any help in countries where politicians, for whichever reason, tend to keep the budget unbalanced. It is much more likely that such occurrence results in a series of measures that increase government spending in a way that the economy becomes dependent on it to the point that the political cost of a spending cut is prohibitive. Indeed, when interest rates increased again after 2008, public spending could not go back to its pre-euro level and, as a consequence, the fiscal situation of Italy and Greece is worse now than before. A different fiscal policy could have significantly reduced the severeness, if not prevented the occurrence, of the sovereign debt crisis in Italy and Greece. But as it turned out, a great opportunity contributed to the disaster.